Support for the different kinds of dirt from Biomes o' Plenty and maybe Farming for Blockheads fertilizers would be very helpful, I really love the extensive configuration for this mod. Is this mod compatible with tough as nail can i use the purified water as rinking water for tan? Damn. I was really in love with this mod because it added a relatively simple mechanic to make farming a little less simplistic, until I discovered that only vanilla crops work with it. Might be worth noting that in the mod description or something just so people don't find out the hard way! ... Maybe a coremod version of it to modify the actual farmland block? I couldn't connect pipes to Aqua Munda tanks and distillator. Mekanism mechanical pipe and Immersive Engineering pipes. Won't you make fresh water bottle? Hey i am messaging both of the creators for the mods i wish to have compatability in hopes you two will figure something out. As of right now primal core lacks any decent water purification, and Aqua munda Lacks and real use besides with one other mod. My hope is the fresh water blocks will act as filtered water so that there becomes a better way to get water that is immersive, fairly difficult and well acting. Found that Aqua Munda 0.1.0beta overrides the hoe action in Voidcraft 1.11.2-0.13.7 while on a dedicated server. In single player mode there is no conflict. When I remove Aqua Munda from the server Voidcraft begins to work correctly with the hoe action. Well yes. That's intentional. 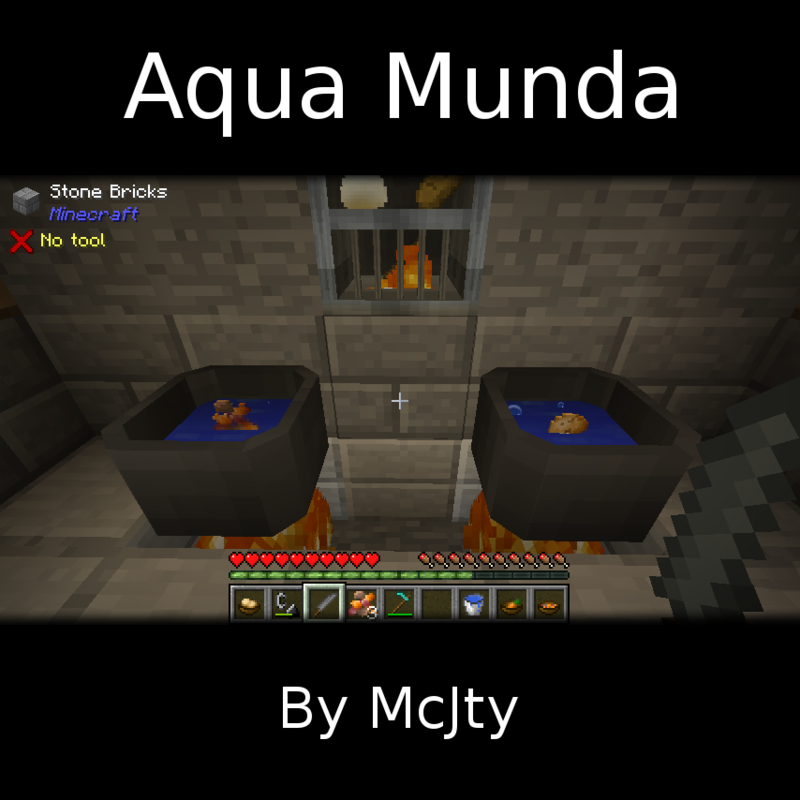 Aqua Munda needs to do the hoe action to be able to place its custom farmland. What is the problem with this? The problem is that is intercepting the hoe action and blocking any other function that wants to use it. In voidcraft, you have a block that you can both collect and craft called softbedrock, you are able to HOE this block to create bedrock farmland so that you can plant ethereal seeds and gain ethereal plants. However, Aquamunda completely blocks that action. Your code is too tight, you shouldn't be intercepting everything and terminating it if it doesn't apply to your mod. Instead your code should allow the unhandled event to pass through so that other mods can access it. I'm currently running into an issue with roots in 1.11.2. I can plant roots' seeds but everytime a crop block is updated it uproots. I tested harvestcraft seeds, they don't have this issue. Now I'm unsure which github I should report this to.